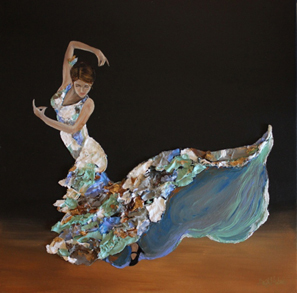 Born in Lakeland, Florida, in 1987, Alexis is a young Cuban artist specializing in commission artwork . She moved to Naples, Florida in 2005 to attend Florida Gulf Coast University, where she obtained a Bachelor of Science degree in Biology and Chemistry. Alexis actively participates in Naples' Third On Canvas art event each year, and is a member of the Naples Art Association. Finding inspiration in the natural world, her artwork allows her the ability to explore different mediums, texture, and movement in her art. Each piece striving to convey and instill the emotions captured in the painting to the viewer. Vivian Garriga was born in Cuba and came to the US as a child. She attended schools in Lakeland, and pursued a very successful career in marketing, until she decided, some 7 years ago, that all she wanted to do was paint. She is inspired by the dramatic sunsets of the Gulf of Mexico, and her explorations take her to blur the line between form and color in her extraordinary paintings. Hermie Ibarra was born in Matanzas, Cuba and now lives in Miami Lakes, Florida. Painting has been her life-long passion, first studying with Ana Sofia Garcia in Matanzas and later with Ginette Lillo in Miami. 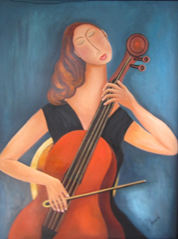 Her devotion to art has continued for many years, both in Cuba and now in Miami Her preferred medium is oil. Heavy texture is Hermie’s signature, as well as the addition to her paintings of flowers, jewelry or other three-dimensional items for a unique effect. Hermie’s work has been showcased in many local exhibits and has received awards in several art competitions.